Have you ever turned yourself a color? A color different from what you were born with. A color different from what sun exposure can create. And no body paint was involved? Because, unless you are a Blue Man, you shouldn’t be using body paint….that is just plain strange. And strange…well I may not have the right to speak of strange in a little bit. So, let’s get this straight… besides becoming sun burnt or if you are lucky…tan, you probably have never turned yourself a color. This I think I am safe in assuming. And you are probably assuming that I have turned myself a color. Between the first year of college and year 4ish….I slowly turned orange. When they say, you are what you eat…they aren’t joking. Especially when you are eating carrots…by the 5lb bag…weekly, or biweekly…Which happened more often than not. 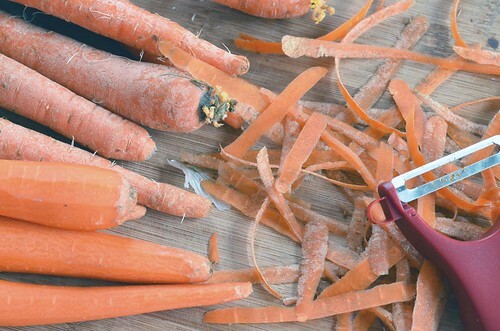 Carrots are crunchy and sweet and packable and quick…and delicious. The shift from freakishly pale to freakishly orange was slow and was most noticeable on the souls of my feet, palms of my hands, tips of my ears and nose. And at the peak…my complexion was a tad orangey. You might say I went a bit overboard. Thankfully, I came to my senses and slowly backed off the carrots and right now, I am back to my freakishly pale skin tone. But, I still love carrots and eat them (in moderation) on a regular basis. I prefer actual carrots that you have to peel to the ever so popular baby carrots. Baby carrots don’t have much flavor and often taste strange…and why all the water in the package? No, I like real honest to goodness carrots. The peel and chop kind. They are sweeter, crunchier, and more flavorful. A little bit more work, but totally worth it. 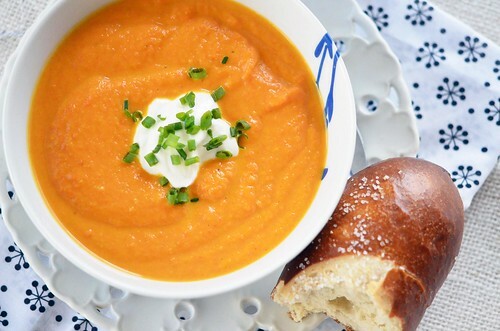 Now, carrots are also great transportation vessels of tasty dips. I think I have dipped a carrot in anything and everything. My favorites include peanut butter, cream cheese, blue cheese dressing, Parmesan cheese, and yellow mustard. But, I normally eat mine plain…maybe with a sprinkle of black pepper. 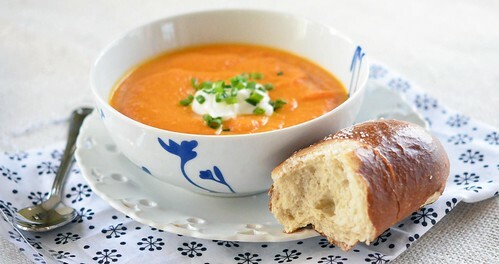 I think the next time I turn myself orange, it will because of carrot soup. 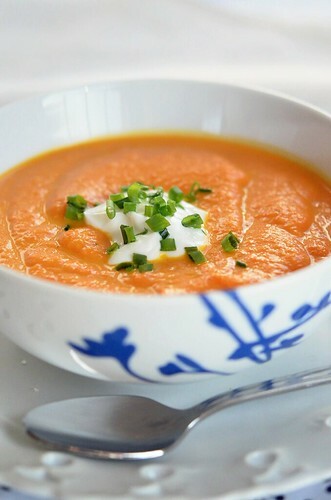 If I had known that carrot soup was so good and simple to make while in college…well I would have looked more like Dr. Seuss’ The Lorax – and I would have turned orange in record time. Smooth and creamy and slightly thick…this soup is pure comfort food. I added a bit of zing with grated ginger….adds flavor and a touch of spiciness. And the roasted garlic. Well, it’s roasted garlic…I don’t think I need to explain that one. With a touch of cream and some chopped chives on top…For this carrot lover, it is simply heaven. The next time you see me…I might be orange. And please tell me…because I won’t notice until I am too far gone. Cover a cookie sheet with tin foil. Lay carrots out onto cookie sheet. Drizzle about 1-2 Tablespoons of olive oil over carrots and then sprinkle with salt and pepper. Toss to coat and arrange in a single layer. Also, prepare garlic for roasting. With a sharp knife, cut off the very top of the garlic head (where it comes to a point), exposing the individual garlic cloves. Place garlic onto a square of tinfoil. Drizzle about 1/2 to 1 Tablespoon of olive oil onto the garlic head. Like a Hershey Kiss, bring up the tin foil around the head of garlic and wrap it securely. Place both the carrots and garlic in the oven and roast. The carrots will take about 20 minutes and the garlic about 30 minutes. Toss the carrots half way through roasting. Remove from oven when the carrots are fork tender and the garlic is soft/tender to the touch. 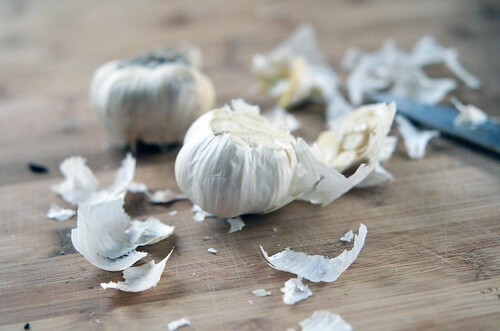 When cool enough to handle, remove garlic cloves from their skins. In a small saucepan, heat 1 tablespoon of olive oil over medium heat. Once warm, add shallots and minced ginger. Saute until shallots are tender and translucent. Grab your blender. Add roasted carrots, roasted garlic cloves, shallots, ginger, and chicken broth to blender. Blend until smooth. Pour mixture back into a medium pan over low/medium heat. Stir in honey and half and half. Add salt and pepper to taste. Once soup is warmed through, ladle into bowls and enjoy. I like to top my soup with a dollop of sourcream or Greek yogurt and chopped chives.